While living aboard and maintaining Rode Trip, we are often asking ourselves, “do we really need it?” This question pertains to anything from a chocolate bar at the grocery store to roller furling for our sails. (The answer, by the way, is undoubtedly YES to both chocolate and roller furling.) Once we determine that we need something we prioritize how soon we need it based on how it might improve our lives or keep us safe, and we determine how easily and affordably can we acquire it. This puts roller furling at a medium priority range because it would add ease to our lifestyle but come at a huge expense; therefore chocolate bars obtain high priority status at a low cost to keep this sail handler happy particularly just after rough passages. Most often we find ourselves repairing what we’ve already got or making something we think we need from whatever materials we have available. I’m convinced my handy husband can repair anything. Most recently he mastered electronics and repaired a spare camera card reader that we bought for the iPad; it had arrived broken. I know what you’re thinking…toss that thing in the trash and hit up Amazon for another, it was only $2.00. Not so easy with limited internet access and shipping to Grand Cayman. Brian disassembled the gadget, poked around with some wires, did a bit of soldering, reassembled the plastic case, and viola the iPad can see our photos! We waste not, we want not. 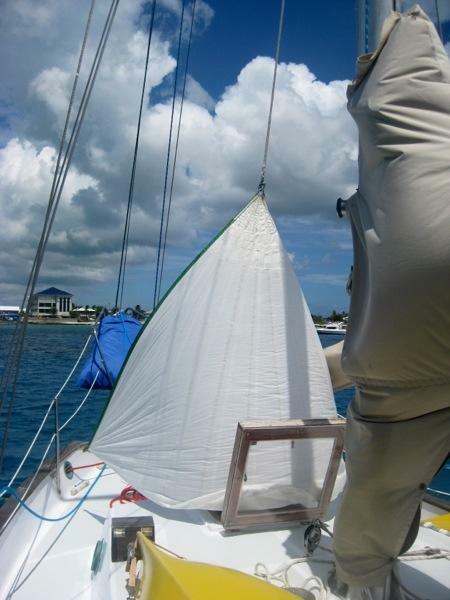 So when our spinnaker blew apart en route to Jamaica, we folded it up and set it aside. Maybe we can repair it? We’d hemmed and hawed about this for weeks. If the material tore so easily, should it be repaired? We weren’t sure. We did however, find another use for the spinnaker. In the Carribean it’s HOT. Rode Trip’s forward and aft hatches are always open and sometimes we open the port holes with hope that a breeze will move through. Breezes do come into our forward hatch but they don’t seem to circulate through our cabin, in fact breezes rarely move beyond the bulkhead. We have a box fan that we’ll turn on from time to time to try to remedy the problem but whatever air the fan pulls through certainly isn’t cooled. We’d noticed that neighboring boats have these handy wind scoops that they fasten onto their forward hatches. The wind scoops catch the breeze and funnel it down into the forward hatch thus pushing it through the boat. 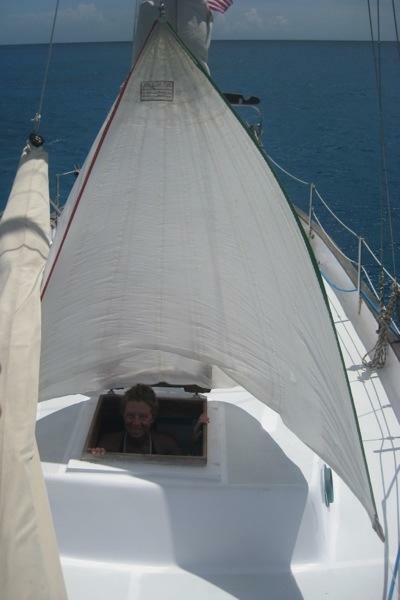 We sampled the work of this fine invention on sv/Serendipity and indeed the breeze was flowing through the entire boat! Hmm…we could make that! Thanks to our deflated spinnaker, we feel we’ve resurrected it for a noble and equally spinnaker-like cause, Rode Trip now has a wind scoop. Thanks to sv/Serendipity’s sewing machine this project was actually completed in minutes rather than our typical hours and hours. It works beautifully! Breezes move swiftly into the hatch and continue flowing aft beyond the bulkhead. Brian and I are cool and comfortable inside. I’m impressed! And, yes, chocolate is key…. 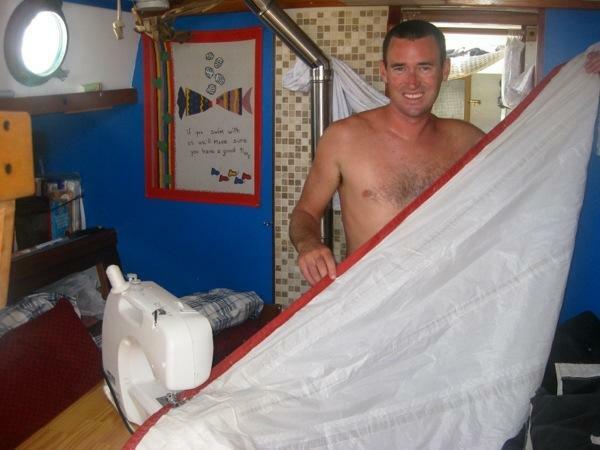 I know the wind scoops work well….but it seemed a shame to waste the spinnaker…when you used it and it ripped were you using a spinnaker pole?…they are damn unrulely without one. You guys are doing great, keep up the good work…er…play. The entire spinnaker saga is a sad story. We would have needed a really, really long pole (about 18 ft.) to properly rig the spinnaker and we thought we’d give it a try without since the pole would have been expensive and difficult to store. It really did fly beautifully and had untwisted itself several times, flawlessly. We took a good hard look at the fabric to determine whether it could be repaired and finally decided to at least make good of what we had and that since it ripped so easily it may just be old. Guess you’re playin too…back into the lasers I’d assume?